It’s been a tough old month for Caracas tabloid 2001, as they face two different forms of repression. Last Friday, three journalists went down to Fuerte Tiuna to cover the Feria del Pernil, which is a special sale of subsidized legs of pork (pernil), a major part of Venezuela’s Christmas menu. 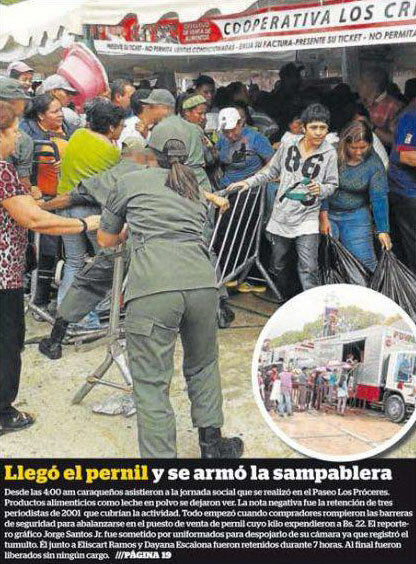 When the team captured a pernil skirmish (see photo), they were detained by the military police and held for seven hours. After his release, photojournalist Jorge Santos Jr. had to be hospitalized because he was injured by several soldiers in the process, including a Brigadier General. They put the poor guy in a neck brace for the next two weeks. As an extra parting gift, Nicolás Maduro called him and his colleagues “agents of violence”. As I mentioned earlier, 2001 was already in hot water before that: in response to this report on the supply to gas stations in Caracas (I couldn’t find the full report online), Prosecutor General Luisa Ortega Diaz opened a formal investigation against the paper for allegedly “creating anxiety in the population”. The investigation was opened in a matter of hours, right after Maduro’s public request fo it, and centers on Luz Mely Reyes, the paper’s uncommonly conscientious (and chavista!) editor. She insists that the editorial line of 2001 will continue to be the same as usual. And what a coincidence, this happened at the same time of the creation of the CESPPA. Free speech in Venezuela is having a very rough year. In the latest presentation before the IAHRC (even if we left the Inter-American Human Rights System, pending cases are still under review), several NGOs denounced the growing use of censorship against the press. But the government denies it and instead gets fake mad at Twitter. Because patria.